As he entered, he saw Lord Shri Hari clad in white cloth and gracing a majestic seat. With great compassion and mercy, Shriji Maharaj was addressing Satsang of Bhuj. Tears rolled from the eyes of Ladudan as he glanced at Shriji Maharaj. He was overwhelmed with great surge of emotion. 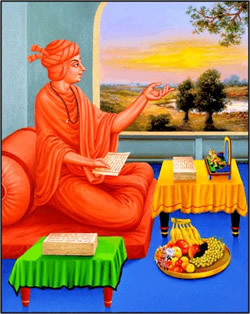 From his place, he offered Dandavat pranam and words 'Aaj ni Ghadi re, Dhanya, Aaj in Gahdi' rolled out from his mouth in form of a devotional song praising divine attributes of Shriji Maharaj. Shriji Maharaj rose from his seat, rushed forward and embraced him with great love. 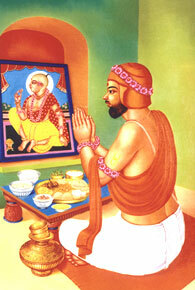 Shriji Maharaj returned to Gadhada with poet Ladudanji. 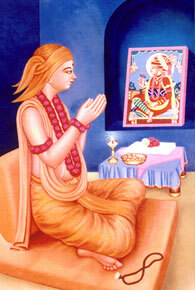 Ladudanji lived a majestic and royal life befitting a courtier. He was always clad in most precious attires and was adorning jewellery befitting royalty. Shriji Maharaj did not like such luxurious life style but instead of preaching directly he changed Ladudanji through the preaching of Laduba, Jivuba where he sent him to try and persuade them to enter marriage. Instead of giving them advise Laduba spoke words which touched Ladudanji's heart and realising who he was and the greatness of Shriji Maharaj he disowned all luxuries and submitted everything at the lotus feet of Shriji Maharaj. Thereafter, there were many instances and invitations from the princely states and kings to grace the court and receive the honour. But he never paid a heed to it. On the way from Gadhpur to Siddhapur, there is one small village named Gerita. 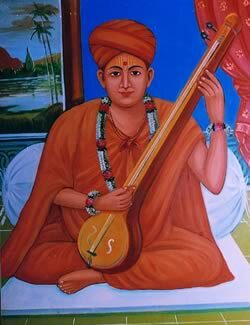 Shriji Maharaj graced Gerita and administrated Bhagwati Deeksha to Ladudanji by giving sainthood name 'Shrirangdasji.' After some time, Shri Maharaj renamed him as Brahmanand. One example of Brahmanand Swami's brilliance at poetry can be seen when on one occasion he was sitting in an assembly. Shriji Maharja saw that Swami was dozing. Shriji always kept nuts with him and He threw a nut at the Swami. Brahmanand Swami opened his eyes and said 'I was not sleeping Maharaj, I was composing a poem.' Shriji Maharaj asked him to recite the lyric. Brahmanand Swami started the lyric instantly and audience repeated the lines one after another. 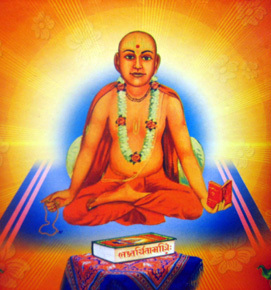 He described the divine image of Shriji Maharaj and His exploits. Besides the construction of great temples in Muli, Vadtal, Junagadh etc, Brahmanand Swami had written scriptures in Hindi and Gujarati. 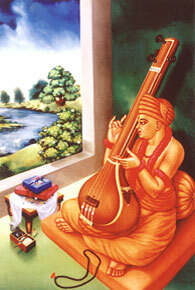 'Brahmanand Kavya' is the collection of his works.